Dual application of entomopathogenic nematodes and fungi on immune and antioxidant enzymes of the greater wax moth, Galleria mellonella L.
Pathogenicity and immunity effects of both the entomopathogenic nematode, (Heterorhabditis zealandica) and the entomopathogenic fungus (Beauveria bassiana) on the last larval instar of the greater wax moth, Galleria mellonella L. (Lepidoptera: Pyralidae), were investigated. Both pathogens were either applied separately or in a combination. The fungus was inoculated first, followed by the nematode on time manner 0, 2, 4, and 6 days. LC50 values for both pathogens were calculated and then used for determination of the changes in immune response-mediated phenoloxidase (PO) and detoxifying enzymes glutathione S-transferase (GST) and non-specific esterase (EST) activities. The results indicated that a positive correlation was found between pathogen concentration and host mortality percentage. LC50 values were 6.49 IJs/larva for H. zealandica and 3.1 × 102 conidia/ml for B. bassiana. Synergistic interactions were found in all combined applications. The degree of synergism increased (reaching 100% mortality), when the nematode was applied 2 days post-fungal infection. PO activity increased significantly (p < 0.05) in a time-dependent manner post-B. bassiana infection. In contrary, the combination of H. zealandica + B. bassiana or H. zealandica alone produced a significant suppressive effect on PO activity over time. GST activity increased significantly (p < 0.05) in 36 h, then decreased at 48 h post-combined application, while the fungal infection enhanced significantly GST activity in time-dependent manner than the control and other treatments. EST activity increased significantly (p < 0.05) in both combined application and the single nematode infection than the single fungal infection, which increased during the initial period only. The increased mortality rates and suppression of phenoloxidase and glutathione S-transferase enzymes, following the combined application suggests a strong synergistic effect between both pathogens. It could be concluded that the tested combined pathogens are compatible element for integrated pest management. The greater wax moth, Galleria mellonella Linnaeus (Lepidoptera: Pyralidae) is one of the most serious pests of honeybee products due to the destructive feeding habit of its larvae. G. mellonella has developed relatively high levels of resistance to insecticides. In addition, the poison residue in the wax is a result of the frequent use of insecticides. Entomopathogenic nematodes and fungi offer an environmentally safe, food safety, host-specific with a very low risk of attacking non-target organisms or beneficial insects, and IPM-compatible alternative to chemical insecticides for pests control (Grewal et al. 2005). Entomopathogenic nematodes (EPNs) from the genus Heterorhabditidae are characterized by a symbiotic association with the bacteria of the genus Photorhabdus, in the intestine of the free-living infective juveniles (IJs) of these nematodes (Ansari et al. 2003). The IJs enter the hemocoel of the insect and release the symbiotic bacteria (Kaya and Gaugler, 1993) then multiply in the hemolymph causing insect death within 48–72 h and establishing conditions for nematode development in the cadaver by providing nutrients. Entomopathogenic fungi (EPFs), especially the isolates of Beauveria bassiana are well-known for their pathogenicity against different target pest species (Laznik et al. 2012). Successful infection depends on the adherence and penetration ability of conidia to the host integuments that achieved by the germ tube itself or by the formation of an appressorium that attaches to the cuticle and gives rise to a narrow penetration peg (Wraight et al. 1998). Conidia of EPFs impart mortality in the target pest by overcoming the complicated host defense-related multiple mechanisms (Hussain and Ming-Yi, 2013). This process requires a prolonged period to impart significant mortality in target pest. Consequently, “dual attack” approach in which two biocontrol agents applied to reduce the dose of toxicant and the host killing time of fungal pathogen was studied (Jia et al. 2016). Hemolymph of insects is a medium for several physiological processes like immune responses and intermediary metabolism. Enzymatic changes in infected larvae would envisage the metabolic stress of the insect experience during the development of pathogen. Many studies have demonstrated the role of enzymes in response to pathogen threat (Müller et al. 2007). Phenoloxidase (PO) is one of the key enzymes activated via prophenoloxidase (PPO) cascade in the cuticle or the hemolymph of many insects in response to the immune challenge (Gillespie et al. 1997). In the defense process, peptidoglycan recognition protein binds to its respective elicitor and results in the production of inactive prophenoloxidase (proPO). PO is involved in the conversion of phenols to quinones and the subsequent production of melanin which are important during defense against bacterial (gram + and −) and fungal infection (Eleftherianos and Revenis, 2011). Moreover, a joint application could easily overcome the host detoxification-related enzymes such as esterase and glutathione S-transferase (Fan et al. 2013). Esterase (EST) is an important detoxifying enzyme in vivo, which hydrolyzes the esteric bond in synthetic chemicals. It is one of the enzymes showing the strongest reaction to environmental stimulation (Hemming and Lindroth, 2000). Non-specific esterases perform important functions in the degradation of toxins of different origins. GST is first of all associated with the participation of these enzymes in insecticide degradation, and its activity has been found to increase in insects resistant to insecticides (Papadopoulos et al. 2000). Besides degradation of xenobiotics, GST takes a part in metabolite removal and protection of tissues from damage by free radicals (Papadopoulos et al. 2000). Previous studies clearly described that host defense-related enzymes play a crucial role by safeguarding the pest from toxins and pathogens. Furthermore, this defense-related enzymes define the fate of target host against invading pathogens (Al Jabr et al. 2018). However, no data are available on the activities of defense-related enzymes in G. mellonella in response to invading fungal pathogen with nematodes. In this study, the interaction effects between Heterorhabditis zealandica and B. bassiana in the lepidopteran, G. mellonella larvae, individually and/or combined were investigated. The effect of both pathogens on insect enzymatic activity was also studied. G. mellonella was obtained from the Department of Crop Pests, Plant Protection Research Institute, Agricultural Research Center (ARC), Giza, Egypt. The culture was reared under the laboratory conditions of 28 ± 2 °C and 65–70% R.H. The larvae were reared in glass jars and provided with an artificial diet consisted of wheat flour (200 g), corn flour (200 g), milk powder (100 g), honey (150 ml), yeast powder (100 g), and glycerol (150 ml). The tops of the glass jars were covered by muslin cloth and secured tightly using rubber bands. Heterorhabditis zealandica was cultured in the last instar larvae of G. mellonella according to Dutky et al. (1964). The emerging infective juveniles (IJs) were harvested from White traps and stored in distilled water at 15 °C. Fungal isolate of Beauveria bassiana (AUMC 3873) was obtained from Mycological Centre, Assiut University, Assiut, Egypt, and grown on Difco™ Sabouraud Dextrose Agar in Petri dishes (90 mm) under a complete dark condition at 28 ± 1 °C for 14 days. The conidia were harvested and suspended in a sterile aqueous solution of 0.05% Tween 80. Total spore counts were quantified microscopically using a hemocytometer. Serial dilutions were made for different concentrations. For concentration-mortality relationship study and determination of median lethal concentration (LC50) for both EPN and EPF, 30 individuals of G. mellonella, last larval instar, were divided into 6 replicates; each contained 5 larvae used for infection. For inoculation, each group of larvae was placed in a plastic cup (9 cm diameter and 5 cm deep), filled with 200-g (oven-dried) soil that moistened with sterile distilled water (10% w/wand) uniformly pipetted on the soil surface with H. zealandica concentrations 5, 10, 20, 40, and 80 IJs/cup or 10, 102, 103, 104, and 105 spores/ml B. bassiana suspensions. Control cups received sterile distilled water only. After inoculation, cups were incubated at 28 °C. Larval mortality rates were monitored every 24 h over a period of 96 h, following nematode infection and 10 days for fungal infection. Where MNema and MFung were the observed proportional mortalities caused by H. zealandica and B. bassiana alone, respectively. Results from a χ2 test, χ2 = (MNemaFung – ME)2/ME, where MNemaFung was the observed mortality rate for the H. zealandica-B. bassiana combination, were compared to the χ2 table value for 1 degree of freedom. If the calculated χ2 values exceeded the table value, there would be a reason to suspect a non-additive effect, that is, synergistic/antagonistic, between the two agents (Finney, 1964). If the differences MNemaFung – ME = D had a positive value, a significant interaction was then considered synergistic, and if D had a negative value, a significant interaction was considered antagonistic. Enzymes were prepared by homogenization of 10 larvae in 40-ml ice-cold phosphate buffer (0.05 M, pH 7.0) by using an ultrasonic homogenizer at (30 W, 10 s). After centrifuging for 30 min (4 °C, 10000×g), the final supernatant was used as an enzyme solution. Protein content of the enzyme solution was measured according to the method of Bradford (1976). All chemicals used were of analytical grade obtained from Sigma. All experiments were replicated 3 times, each with 10 larvae. Assays also were performed as three technical replicates per preparation for determination of phenoloxidase (PO), glutathione S-transferase (GST) and non-specific esterase (Est) activity. Activities of enzymes were assessed, following the standard methods described by Ishaaya (1971), Habig et al. (1974), and Van Asperen (1962), respectively. Statistical analysis was performed using Analyze-it software (Analyze-it, Leeds, UK) in accordance with the method of Maxwell and Delany (1989). The present study examined the application of each pathogen alone where the host mortality increased by increasing pathogen concentration. Data of the combined pathogens showed a positive correlation between H. zealandica and B. bassiana concentrations and the mortality percentages of the tested last instar G. mellonella larvae. Larval mortality rates by H. zealandica increased from 40 to 93.33% as the dose was increased from 5 to 80 IJs/larva, compared with 0% in the control at 96 h post-infection. Whereas, larval mortality rates by B. bassiana increased from 26.67 to 86.67% as the dose was increased from 10 to 105 conidia/ml, 10 days post-infection than the control (13.33%) (Table 1). LC50 value reached 6.49 IJs/larva (slope = 1.790) for H. zealandica infection, while it was 3.1 × 102 conidia/ml (slope = 0.452) for B. bassiana. Synergistic interactions were observed between H. zealandica and B. bassiana against the last larval instar of G. mellonella (Table 2). The degree of synergy increased, when H. zealandica was applied 2 days after fungus infection (χ2 = 50, d.f. = 1, p < 0.001) as compared to the infection at the same time (χ2 = 17.32, d.f. = 1, p < 0.001), 4 days (χ2 = 17.64, d.f. = 1, p < 0.001) or 6 days (χ2 = 6.41, d.f. = 1, p < 0.001) post-fungal infection. The current data agree with Molina et al. (2007) and Ansari et al. (2008) who showed that it is possible to establish positive interactions, synergistic by applying EPFs and EPNs at the same time or in short intervals of 2 days with other pests. Bacca and Cesar (2014) found that the percentage of mortality of G. mellonella treated with nematode after 2 days post-fungus infection was higher and statistically different as compared to that of individual treatments. Ansari et al. (2008) suggested that one of the main factors of a synergistic interaction was the weakening of larvae by an initial fungal infection, which inhibited the larvae from feeding normally. The fungus also increased the host’s susceptibility to nematodes by generating a stressful condition, emitted a higher concentration of CO2 in response to fungal colonization that attracted nematodes and altered behavior (Ansari et al. 2008). Ansari et al. (2008) suggested that when the nematodes and fungi are inoculated at the same time, their interaction had an additive effect on host mortality, when the two control agents were acted independently. In this study, however, these effects were not present in any of the application times (0, 2, 4, and 6 days). Studies of the interactions between EPNs and EPFs with the host’s immune system are mainly focused on the effect on prophenoloxidase (Cooper and Eleftherianos, 2016) and the detoxification enzymes glutathione S-transferase and esterase (Kerchev et al. 2017). PO is a key enzyme in insect immunity against pathogens. PO converts phenols to quinones, which subsequently polymerize to form melanin (Cerenius and Soderhall, 2004). Obtained results indicated that G. mellonella responded to fungal infection by a significant increase in PO activity than the control and other treatments. The defensive response to fungal infection leads to elevated levels of PO in hemolymph and other enzyme cascades (Gillespie et al. 2000). Immunization of G. mellonella with the fungus Aspergillus oryazae led to increasing phenoloxidase activity 24–72 h after treatment (Zdybicka-Barabas and Cytrynska, 2010). Mirhaghparast et al. (2013) showed that PO increased significantly after injection of Spodoptera littoralis (Boisd.) larvae by B. bassiana. In stark contrast, PO activities decreased significantly during the initial period after combined treatment of H. zealandica and B. bassiana, suggesting a synergistic interaction in the host. Hiromori and Nishigaki (2001) reported that mixed applications of two pathogens inhibited PO activity in the larvae of the beetle, Anomala cuprea, and the granular cells were suppressed. Yaroslavtseva et al. (2017) observed a reduction of PO activity on the third day of combined treatment with the entomopathogenic bacteria (Bt) and M. anisopliae that was an evidence of strong suppression of beetle of Leptinotarsa decemlineata immunity. Jia et al. 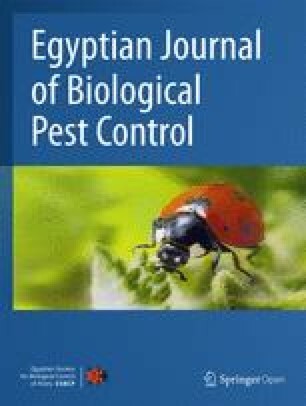 (2016) showed a reduction in phenoloxidase activity at the initial period after combined treatment of M. anisopliae and diamide insecticide. The authors speculated that the observed interaction might be due to an inhibition of the larval humoral defense and cellular immune systems. Inhibition of PO in our experiments might also be caused by a weakened humoral defense or cellular immune systems, as a result of the multiplier effect of nematode and fungi together that result in a rapid death within 2 days post-combination. The phenoloxidase activity in response to H. zealandica and B. bassiana alone or in combination are shown in Table 3 whereas treatment with B. bassiana alone showed an appositive correlation between time post-infection and PO activity reaching 50, 47.70, 60.27 ± 2.3, and 72.20 ± 2.9 at 12, 24, 36, and 48 h, respectively, post-infection as compared to the control and other treatments. While combining of H. zealandica with B. bassiana and H. zealandica alone produced a significant suppressive effect on PO activity over time, which was more significant in response to the joint application, reaching 29.76 ± 0.8, 16.97 ± 0.3, 13.33 ± 0.3, and 8.63 ± 0.7 at 12, 24, 36, and 48 h post-infection, respectively, while in the single infection of H. zealandica were 32.00 ± 14, 19.10 ± 05, 12.33 ± 0.2, and 15.83 ± 0.4 at 12, 24, and 36 h, respectively, over the control and other treatments (Table 3). In Table 4, individual treatment with B. bassiana resulted in a significant increase in glutathione S-transferase activity in time-dependent manner than the control and other treatments, recording 84.73 ± 3.3, 36.33 ± 1.4, 72.17 ± 2.1, and 123.33 ± 3 at 12, 24, 36, and 48 h post-infection, respectively, while individual treatments of H. zealandica or combination of both H. zealandica with B. bassiana increased significantly up to 24 h post-treatment, followed by a decrease in enzyme activity during the later periods as compared to the control and the fungal treatment that reached 74.17 ± 1.6, 99 ± 1.5, 66.2 ± 1.6, and 49.03 ± 1.5 for H. zealandica alone and 139.33 ± 5.4, 120 ± 5.5, 102.33 ± 2.8, and 52.03 ± 2.3 for the combination of both H. zealandica and B. bassiana at 12, 24, 36, and 48 h post-infection, respectively. The results in Table 5 revealed that individual treatments with B. bassiana resulted in a significant increase in esterase activity at 12, 24, and 36 h post-infection, reaching 691 ± 19.8, 591 ± 8.7, and 637.67 ± 14.9, respectively and then induced insignificant difference with the control at 48 h post-infection (569 ± 14.3), while the individual treatment with H. zealandica and the combination of H. zealandica with B. bassiana resulted in significant increases in esterase activity in a time-dependent manner as compared to the control. The fungal infection reached 299 ± 5.9, 264 ± 11.7, 512.33 ± 6.2, and 1250.33 ± 55.4 for H. zealandica and 449 ± 15.6, 562.33 ± 14.8, 1008.33 ± 24.1, and 1104.33 ± 20.9 for the combination of both H. zealandica with B. bassiana at 12, 24, 36, and 48 h, respectively, compared to the control and fungal treatment. Glutathione S-transferase (GST) and esterase (EST) are the major enzymes involved in detoxifying penetrating xenobiotics in insects (Ali et al. 2017). Obtained findings showed an increase in GSTs and ESTs activities during the initial 24 h and then GSTs decreased sharply later in the joint application and nematode infection, while the ESTs activity remained high. Increased detoxifying enzyme activities against mycoses and other infections represent the insect’s response to bodily intoxication by metabolites or the host-tissue-degrading products of pathogens (Serebrov et al. 2001). Alterations in the activities of GST and ESTs in G. mellonella and L. migratoria infected with EPFs are considered to constitute non-specific body responses to integument damage, induction of additional isoenzymes or fungal toxins (Serebrov et al. 2001). The early activation of non-specific esterases and GST in the hemolymph at the initial stage of acute mycosis was followed by a decrease to control levels (Dubovskiy et al. 2010). We would like to thank Dr. Reda E.A. Moghaieb (Genetic Engineering Research Center, Faculty of Agriculture, Cairo University, Egypt) for helping in statistical analysis, critical editing of the manuscript. All datasets are presented in the main manuscript. SAMI participated in experimental design, practical work, and manuscript writing. HHAS participated in the experimental design and practical work, and coordinated in manuscript writing. MAT participated in discussion and provided intellectual support to this research. All authors read and approved the final manuscript.